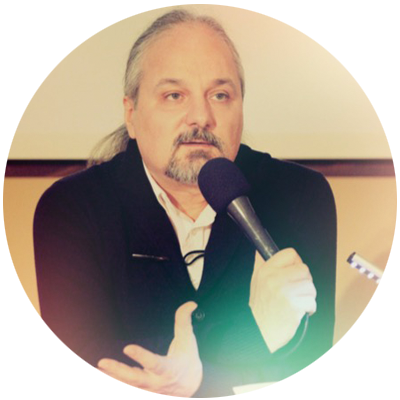 Nicolae Catrina (Adinathananda) is a yoga teacher with more than 30 years of experience. Two decades ago he founded the only Kashmir Shaivism course in Europe that offers to the thousands of students from Romania and abroad the riches and profoundness of this spiritual tradition in a unique way that is adapted to western mentality. His deep interest for various forms of authentic spirituality and his spiritual intuition have helped him elaborate over time a series of initiatic courses, such as Tantric Alchemy, Enneagram or esoteric I-Ching. He also created a unique system for the revelation of the Essential Self, Atman, based on a supramental approach – but also a very accessible one – for the revelation of the Self (based on the enlightening esthetic experience) that has already helped thousands of aspirants take important steps towards discovering their essential divine nature. He is the author of many books on Shaivism, Yoga, Tantra, Alchemy, initiatic art etc. He has translated many important yogic and tantric texts, such as Sundaryalahari, Shiva Samhita or Gheranda Samhita. He exclusively offers in his Shaivism courses numerous traditional, esoteric works, such as Shiva Sutra, Spanda KArika, Vijnana Bhairava Tantra etc., as well as their practical, deeply transforming knowledge in a new, innovative way.